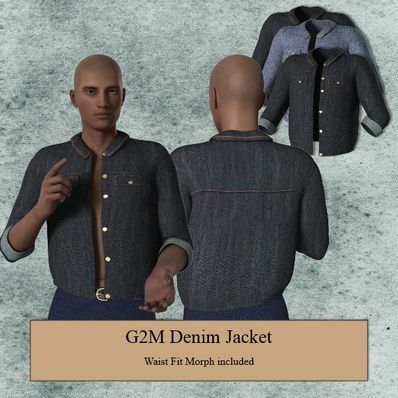 Denim Jacket for Genesis 2 Male for use in Daz Studio 4.6. I would have preferred it to be longer, but thank you. A ton of lovely creations in your website. Very tasteful and classy. Thank you so much,I really needed this! Great Jacket indeed.This will please many people out there searching for Denim.Many thanks !! Very nice jacket with fine details & textures. Thank you very much! Been wanting something like this! Thank you! Rolled up sleeves. Way cool Wendy. Thank you. This is an amazing Denim Jacket, the detail is outstanding as usual. It looks so realistic, just like ones I have see. You're the BEST!! Thank you also for the 3 textures, love the light denim you included. Have a great day! Thanks so much - for this and anything else I've forgotten to say thanks for recently :). Thank you. A great style.